Mark 10:17-31: He was setting out on a journey when a man ran up, knelt before him and put this question to him, ‘Good master, what must I do to inherit eternal life?’ Jesus said to him, ‘Why do you call me good? No one is good but God alone. You know the commandments: You must not kill; You must not commit adultery; You must not steal; You must not bring false witness; You must not defraud; Honour your father and mother.’ And he said to him, ‘Master, I have kept all these from my earliest days.’ Jesus looked steadily at him and loved him, and he said, ‘There is one thing you lack. Go and sell everything you own and give the money to the poor, and you will have treasure in heaven; then come, follow me.’ But his face fell at these words and he went away sad, for he was a man of great wealth. Christ the Lord The rich aristocrat came to Christ and threw himself at his feet. It doesn’t surprise us; it didn’t surprise anyone at the time. The truly surprising thing is that everyone didn’t throw themselves at his feet. Though he tempers this man’s enthusiasm, which may be based too much on mere emotion (as ours so often is), Jesus answers his question – he knows what this man needs in order to achieve the fullness of life for which he thirsts, and he tells him. Christ is the Lord; he has the answers we seek. Going to him and his delegates in the Church is the right thing to do when we need direction and light for our lives, but unlike the man in this encounter, we also need to be ready to accept whatever Christ tells us. After all, he is the Lord. This man had felt God calling him to experience the “eternal life” of a deeper, definitive divine intimacy. He went to Christ to find out how to follow that call. Christ makes it very simple: give your wealth to the poor and become my disciple. The man balks, and, sadly, rejects the invitation. He had built his happiness around his wealth; it had become his idol, his lord, the god without whom he could not live. Jesus recognized that and opened to the door to freedom, but the rich young man preferred his comfortable chains; he could not let go of his gold in order to grasp the hand of his Lord. Christ the Teacher This tragic occasion, which no doubt pained Christ deeply, offers Jesus a chance to put forth his teaching on material goods and the virtue of Christian poverty. Jewish teaching at the time considered material prosperity a sign of God’s favor, which is why the disciples were “more astonished than ever” when Jesus said that it would be hard for the rich to live in communion with God. Thus Jesus needed to use a vivid, unforgettable image to drive his point home: a camel will have a better chance to get through the eye of a needle than a rich person will have of getting into Christ’s Kingdom. (Some scholars contend that this “eye of the needle” referred not to the sewing instrument, but to a narrow gate in Jerusalem’s city walls, which only skinny camels carrying no baggage could squeeze through. Either way, the message is the same.) The Lord is merely explaining what just happened in his conversation with this rich man (a young man, in fact, as we learn from the accounts in the other Gospels). Material wealth is not evil in itself – God made the universe and filled it with good things for our use and enjoyment. But because of our fallen nature we tend to attach ourselves too closely to things, to link our hopes too tightly to them. Wealth can easily give us the illusion of being self-sufficient, of being totally in control of our happiness and our destiny. The truth always remains, however, that we are dependent on God for everything; we are fragile, unable to achieve total, lasting fulfillment by ourselves. It is easier to keep that in mind when it is hard to make ends meet. Out of this hard truth rises the Christian virtue of poverty. It doesn’t necessarily imply choosing to live in misery. Rather, it involves the conscious decision to live with dignity, but responsibly and frugally. Material wealth needs to be put to work for the extension of Christ’s Kingdom, while at the same time hedging the natural tendency to excess and self-indulgence with habits of self-discipline and voluntary sacrifices in order to avoid becoming money’s slave. The heart that is detached from things is freer to love others. It may attract the sneers of worldly peers, but it attracts the smile of God, and in any case, it’s worth being looked down upon now if it means enjoying God’s approval for all eternity. Christ the Friend St. Mark points out that Jesus looked at this young man and “loved him” and then invited him to give up what he held most dear. Christ knows, as he explains to Peter, that he himself is a reward far greater than anything this world has to offer. Thus, when he shows a special love for certain souls, he often asks them to forsake the passing goods of the world and consecrate themselves totally to him, the eternal good. That invitation, as Mark makes so clear, is a result of his love. He doesn’t call people to serve him more closely in order to punish them – his heart is not cruel. Unfortunately, however, it is not just the rich young man in this passage who turns away from Christ’s love: many of us have riches of our own (plans, pleasures, hopes, relationships, etc.) that hold us back from answering a special call to follow the Lord more closely. He wants a closer friendship, and we foolishly hang back. 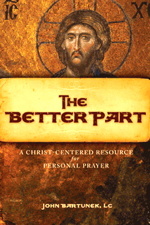 Art for this post on Mark 3:17-31: Cover of The Better Part used with permission. Christ and the Rich Young Ruler, Heinrich Hoffmann, 1 June 1889, PD-US author’s life plus 100 years or less, Wikimedia Commons.